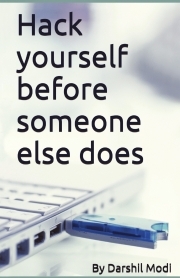 Description of "Hack Yourself Before Someone Else Does"
hack yourself before someone else does which aims to provide its readers indepth knowledge of ethical hacking, hacking techniques used by hackers and how to secure yourself from being the victim of cyber attacks. This book takes you from very basics of networking to advanced hacking techniques like session hijacking, sql injection and wifi cracking. The only book that explains major aspects of cyber security in great detail and in easily understandable language. Darshil Modi is a professional ethical hacker and cyber security expert and is pursuing bachelors degree in the field of computer science. He is glad to publish his first book titled "hack yourself before someone else does". He lives in Ahmedabad, India. He is on his way to make technology a better place to dwell with. Reviews of "Hack Yourself Before Someone Else Does"
There is no wonder that such a quality food item that too instant delivery is getting availed with a low price from such a reputed company which makes it better day by day with increasing customers. One of the reasons for the success of this fast food center is the utmost productivity with every claimed announcement. There is not even single negative feedback for anything claimed. Every buyer still now has got faster response and faster delivery instantly without any minor delay in the serving. This service cannot be regretted by anyone in the busy world as all of us want the fastest device with less money and quality food with convenience. Overall it’s an all in one fast food restaurants in the world that can’t be so easily conquered by any newcomers in the business.